Employee Presentation Results for the Third Quarter of 2014. 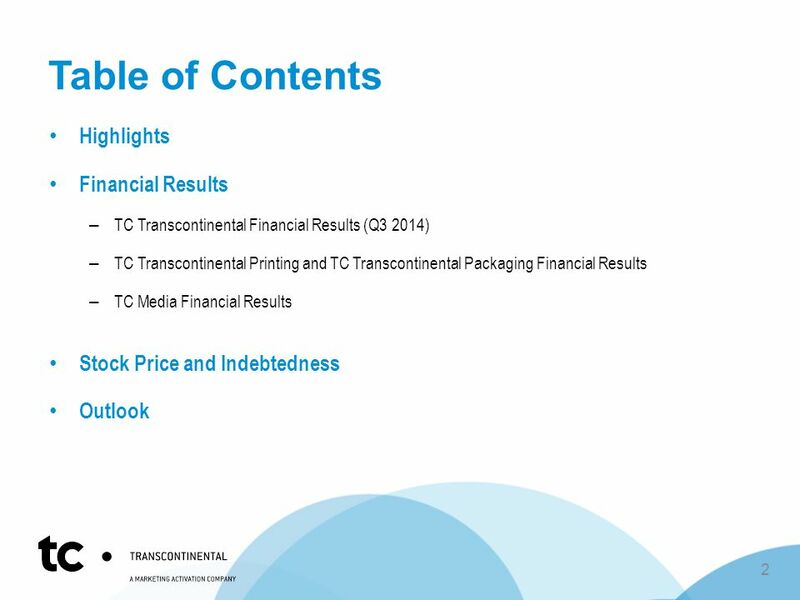 6 Financial Results – Q3 The increase in profits between Q3 2013 and Q3 2014 can be explained principally by our acquisition of Capri Packaging and the sale of the assets of Rastar, new distribution contracts, our cost optimization initiatives in the Print sector and the reduction of our cost structure in the Media sector. 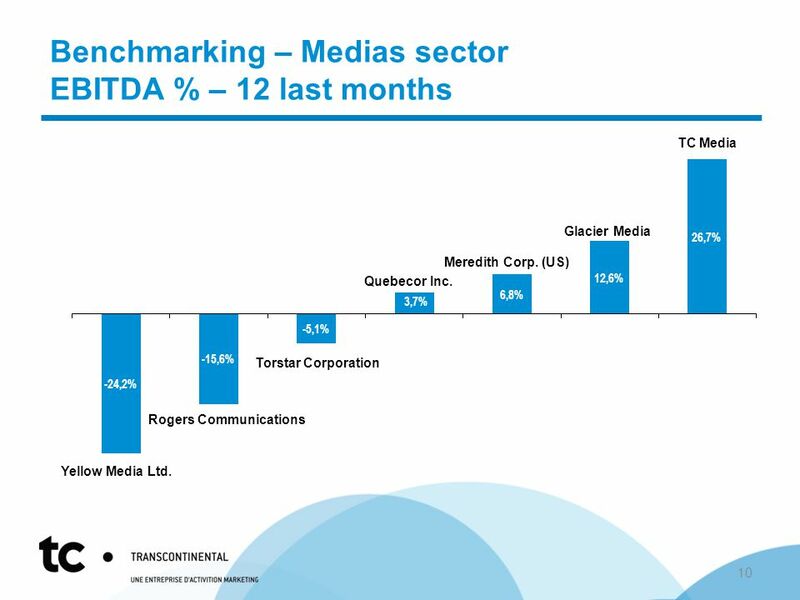 These elements were partially offset by difficult market conditions with respect to advertising spending in both local and national markets. 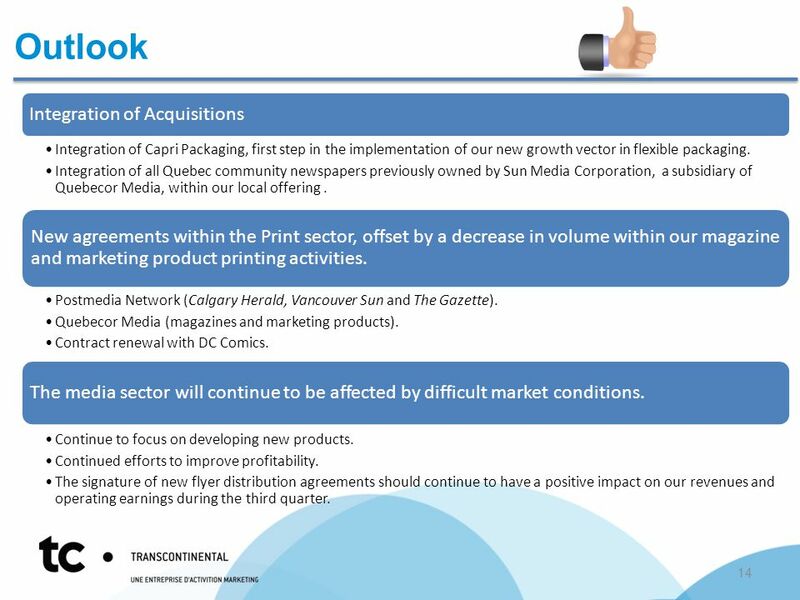 The net income applicable to participating shares in the third quarter of 2014 increased to $44.2 million, compared to $30,1 million in the third quarter of 2013. This improvement stems primarily from lower income taxes due to the net increase in the carrying amount of deferred income tax assets, and improved operating earnings. The adjusted net income applicable to participating shares increased to $33,4 million in the third quarter of 2014, compared to $37,6 million in the third quarter of 2013. 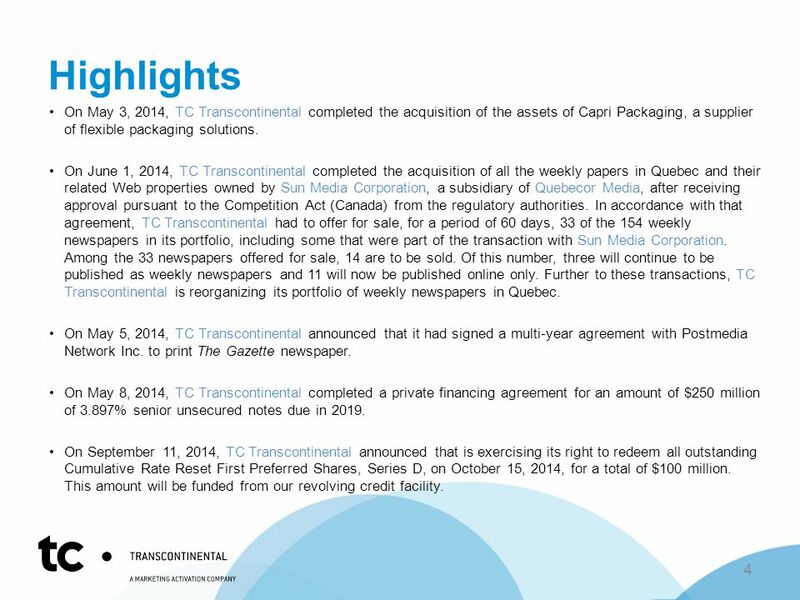 6 Revenues increased by $9.3M or by 1.9 %. 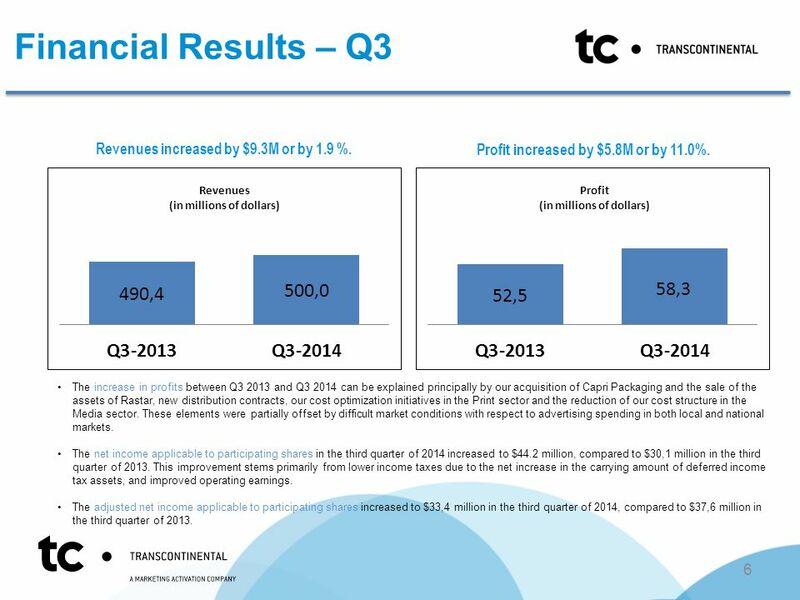 Profit increased by $5.8M or by 11.0%. 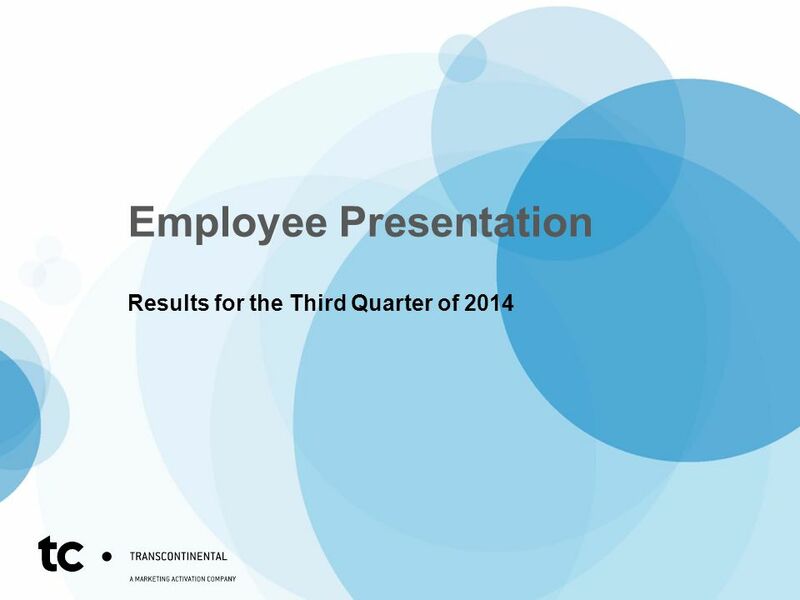 Download ppt "Employee Presentation Results for the Third Quarter of 2014." 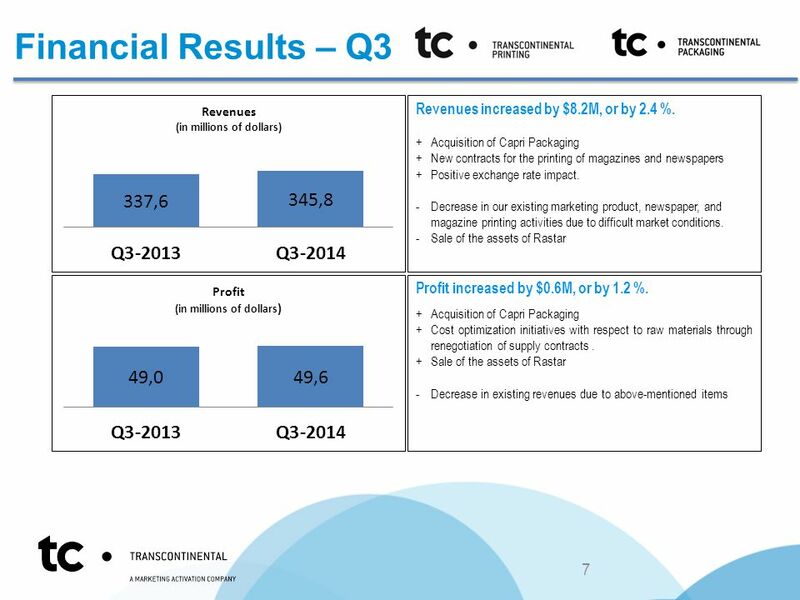 Employee Presentation Results for the First Quarter of 2014. 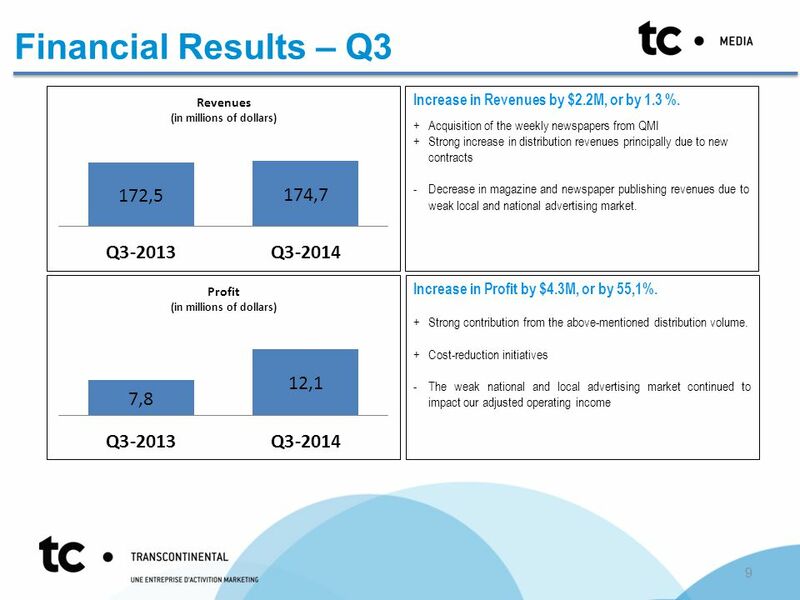 QUARTERLY MEETING TC MEDIA MANAGERS October 22, 2013. April 27, 2009, Atlas Copco Group Q1 Results April 27, 2009. 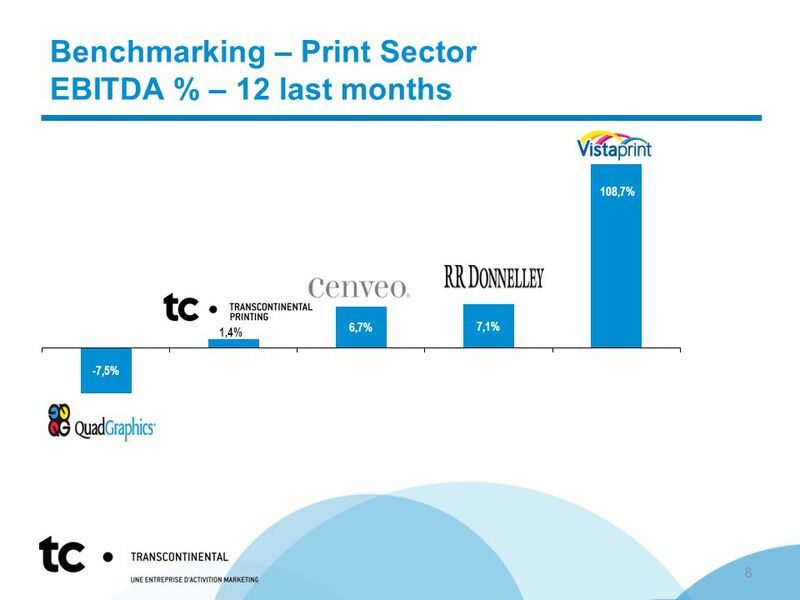 Employee Presentation Results for the Second Quarter of 2014. November 11, 2003 All You Ever Wanted to Know About Financial Statements Statement of Cash Flows All You Ever Wanted to Know About Financial Statements. 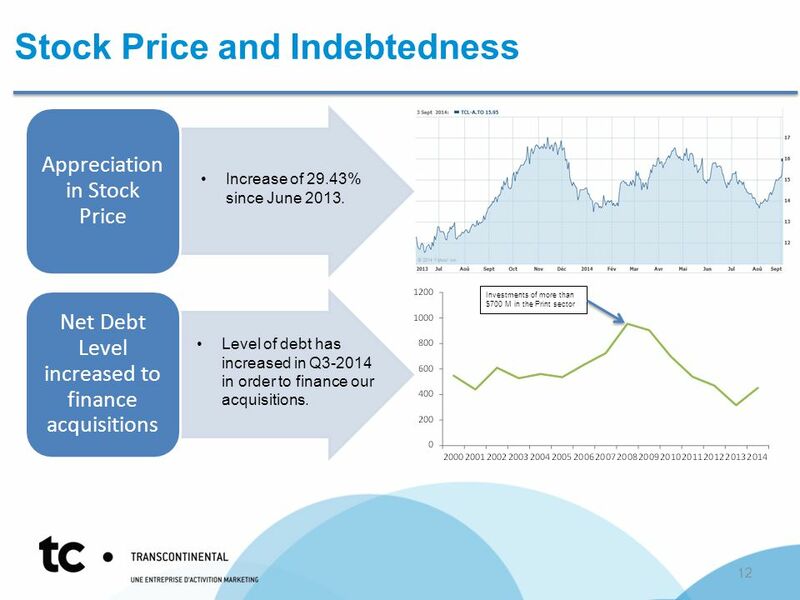 AGM Finance Update Derrick Sturge, Vice-President, Finance & CFO June 4, 2014. 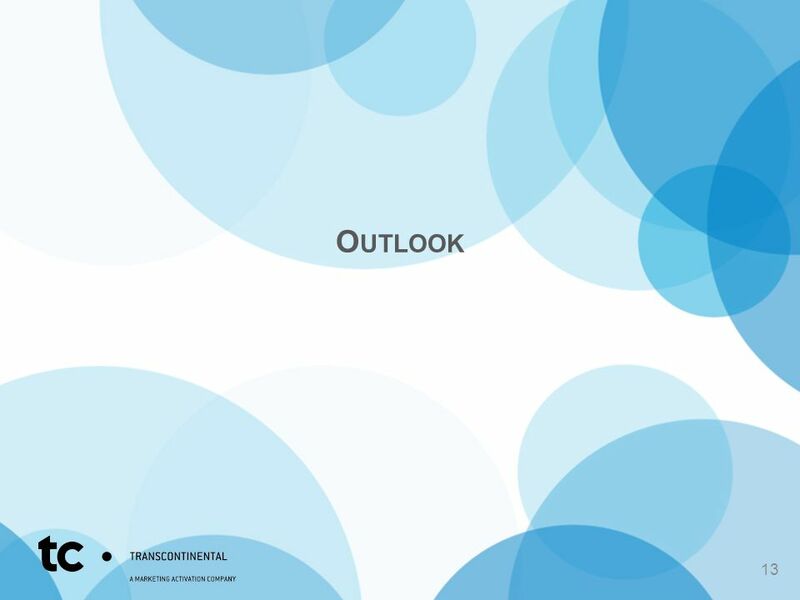 An Ebiquity company Interim Presentation Six months ended 31 October 2009 … another period of significant progress. ACCT 201 ACCT 201 ACCT 201 Reporting and Analyzing Equity UAA – ACCT 201 Principles of Financial Accounting Dr. Fred Barbee Chapter 11. ©Cambridge Business Publishers, 2013 FINANCIAL STATEMENT ANALYSIS & VALUATION Third Edition Peter D. Mary LeaGregory A.Xiao-Jun EastonMcAnallySommersZhang. Long-Term Liabilities: Bonds and Notes 12. ©CourseCollege.com 1 18 In depth: Bonds Bonds are a common form of debt financing for publicly traded corporations Learning Objectives 1.Explain market. P R E L I M I N A R Y R E S U L T S 1 March 2006.  2004 McGraw-Hill Ryerson Ltd. Kapoor Dlabay Hughes Ahmad Prepared by Cyndi Hornby, Fanshawe College Chapter 12 Investing in Bonds 12-1.
Business Portfolio Adding Value to Investors Luiz Fernando Rolla CFO October, 2008. 22 October 2008 Slide 1 Results 3Q08 Results 3Q08 Martin De Prycker, CEO 22 October 2008.